Filed under: Art,Fun,NaNoWriMo — Posted by the Network Geek during the Hour of the Tiger which is terribly early in the morning or 5:22 am for you boring, normal people. So, at this point, you should be just about done with your novel for NaNoWriMo. If you’ve kept pace, in the next 24 to 48 hours, you should be wrapping up your 50,000+ pages and breathing a giant sigh of relief. Filed under: Art,Fun,NaNoWriMo — Posted by the Network Geek during the Hour of the Tiger which is terribly early in the morning or 5:53 am for you boring, normal people. If you’re doing NaNoWriMo this month, and you’re reading this post, you’re either so far along on your book that you have time to burn, or you’ve given up. Filed under: Art,Fun,NaNoWriMo,Things to Read — Posted by the Network Geek during the Hour of the Tiger which is terribly early in the morning or 4:24 am for you boring, normal people. The infamous science-fiction workshop lexicon of “things to not do”. Over the years, so much has been written about what to do and what NOT to do in fiction that it’s a little overwhelming sometimes. Filed under: Fun,Fun Work,NaNoWriMo,PERL — Posted by the Network Geek during the Hour of the Tiger which is terribly early in the morning or 5:26 am for you boring, normal people. So, in support of NaNoWriMo, this month, I’ve decided to serve up nothing but writing-related links. Filed under: Geek Work,Never trust a Network Admin with a screwdriver,Pressgram — Posted by the Network Geek during the Hour of the Snake which is just before lunchtime or 11:16 am for you boring, normal people. 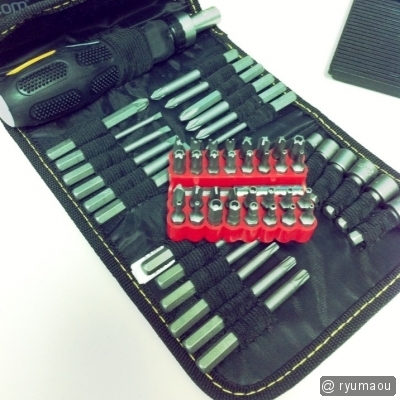 A new screwdriver set, with a complete set of long-shaft bits, and a special set of “tamper resistant” bits for work. Purchased because the original in-house installers of a projector are all claiming ignorance now that we have to replace it. Luckily, Harbor Freight Tools had a sale and this whole set was less than $20! The screws in question, incidentally, are the “hex” or “Allen wrench” style with a post in the center. Kind of deceptive and frustratingly hard to identify when you don’t know their name! Filed under: Art,Fun,Life Goals,NaNoWriMo — Posted by the Network Geek during the Hour of the Tiger which is terribly early in the morning or 5:58 am for you boring, normal people. NaNoWriMo starts today, but I won’t be participating this year. Maybe next year, after my life is just a little more settled and I’ve spent a year getting my writing chops back. Comments Off on Let the writing begin!